Valid for any movie, any time. Valid for one box ofﬁce admission. Additional premiums may be applied for specially priced ﬁlms and/or events which are priced higher than normal box ofﬁce ticket pricing. 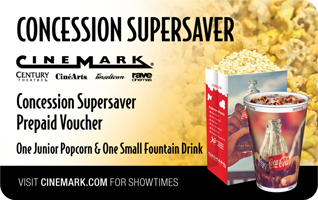 May be redeemed at any participating Cinemark Theatre nationwide and does not have an expiration date. Present at box ofﬁce. This ticket is non-refundable. Not redeemable or exchangeable for cash. Valid for one free junior popcorn and one free small fountain drink. 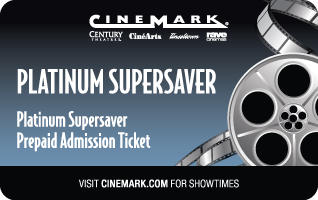 May be redeemed at any participating Cinemark Theatre nationwide and does not have an expiration date. Present at concession stand. This ticket is non-refundable. Not redeemable or exchangeable for cash or equivalent. Ticket may be redeemed toward upgraded size of one or both products. Must pay additional cost of upgrade. Not valid for bottled water, alcohol or candy items. *Supersavers are non-refundable. Cannot be redeemed or exchanged for cash or equivalent. Minimum purchase quantity of 50 per Supersaver per order and in increments of 10 after (60, 70, 80, 90….etc.) No restrictions or expiration date. Customer responsible for additional fees associated with special engagements or upgrades. May be redeemed at all U.S. Cinemark theatres. Cinemark brands include Cinemark, Century Theatres, CinéArts, Rave and Tinseltown. Orders received after 3:00 pm CST will be shipped the following business day.